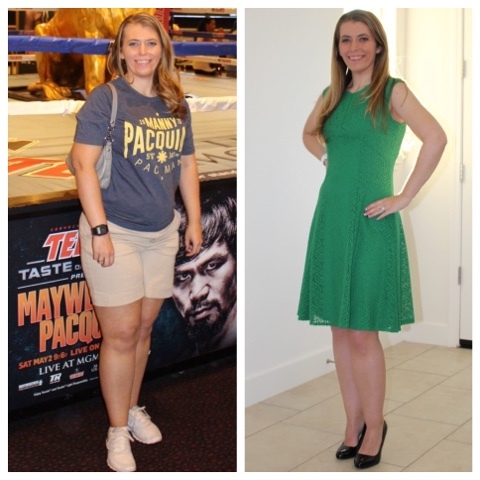 When I got engaged in 2014, I knew that I wanted to lose weight for our wedding. It was a day I had always dreamed about and I wanted to look my best. I also started a new job and in that new position I was sitting a lot at a desk which was unlike my previous job where I was on my feet the majority of the day. By the time I bought my dress in December of 2014, I weighed in at 148 pounds. For some people this number may not look too high but to me it was one of the highest weights I had ever weighed in at. Take into account the fact that I'm only 5'4'' in height. The majority of my weight is usually in my lower half and especially my legs. They just love to hold on to that weight and it's been that way my entire life. The first place I'll lose weight is in my face and chest. So in May of 2015, I really set out to lose the weight. I started eating portioned meals that consisted of broccoli, rice, chicken or fish. Well guess what... I hate broccoli and asparagus. Which was the alternative to the broccoli. I also went to the gym 5 times a week and worked with a trainer. The results in one week... 7 pounds. That was a crazy amount for me to lose in one week! It wasn't water weight either because I was drinking a gallon (literally) a day. So the next week, I was working out at the gym and on the way home all of my muscles seized up and I had no idea what was happening to me. Queue a ride to the Emergency Room in an ambulance and I was told I had literally no potassium in my body, my electrolytes were depleted and that I indeed was dehydrated. I said screw this! This wasn't real life for me. I don't have time to go to the gym five times a week. I'm tired after work, I don't want to get up at the crack of dawn to go and I'm just NOT a 5 times a week to the gym type of person. Nor am I a broccoli kind of girl. I'm just not! So after I started eating my normal food again and drinking my water. I had been a huge fan of Diet 7Up and Sprite Zero. I started drinking nothing but Smart Water. Then we had some crazy life moments and stress kicked in. Then the summer months rolled in and then the fall. I was having tons of anxiety for the first time in my life. By my wedding I had got down to 120 pounds. It was the smallest I had ever been in my life! I couldn't even remember a time in high school or college that I weighed 120 lbs. I was always around 125. But on my wedding day, I was down 28 pounds. Luckily, I knew I had lost a lot of weight and started my dress altering's in October. It had to be taken in multiple sizes. Since our wedding I've been able to keep the weight off +- a few pounds. Right now I'm sitting at 128 lbs. but I don't sit around and think about it. I like where I'm at and I'm ok with that! I like how my clothing fits and I like what I see back in the mirror. Will I always want legs like Carrie Underwood and Arms like a bikini model? Sure! Do I want rock hard abs that would make those bikini models cry? Sure! But for right now I'm happy with where I'm at. That is amazing! I have the same problem with my legs, especially my calves. You look wonderful in both pics! But congrats, what a great accomplishment! That's wonderful that you are happy with your weight and have been able to maintain it. My weight has gone up and down over the past few years. I need to work on being more consistent with my diet and exercise!! I have the same thing happen with my body. I barely workout and my entire body cramps and seizes so bad. It makes it so hard to work out. It's so painful! You look fantastic girl, good for you !! You look great, girl. Keep it up! Love this! I hate working out too I never even stick with it.. Love that we both have found something that works! I still love my tacos and sushi but hey lost 30 lbs now and counting! whoop!